This seven band vertical features super high performance, low cost, low profile, and ground mounting. 7 bands: 40, 30, 20, 17, 15, 12, 10 Meters, full 1500 Watts PEP. Great for use as a permanent or temporary antenna in restricted spaces. Full 11' collapses to 7 feet to hide behind trees, fences, and bushes, etc. MFJ-1794 has automatic bandswitching, low radiation angle for DX, and is omni-directional. It features highly efficient end-loading. The entire length of the antenna radiates, and you get a low SWR across all bands. You can easily ground or roof mount with radials and a ground rod. 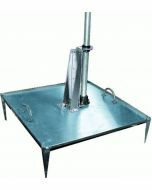 Portable or permanent operation with MFJ-1901, $99.95, a 2x2 foot ground-coupled stainless antenna base. Hardware, U-bolts included.